Directed by Eugenio Martin, 1974’s Horror Express (or, if you prefer, Panic On The Trans-Siberian Express), begins in Manchuria where an English scholar named Alexander Saxton (Christopher Lee) and his team discover some sort of animal-man frozen in the ice. They crate this big hairy guy up and load him onto a train bound for Moscow, Saxton hopeful that he’ll be able to get the thing back to his home turf for further study. 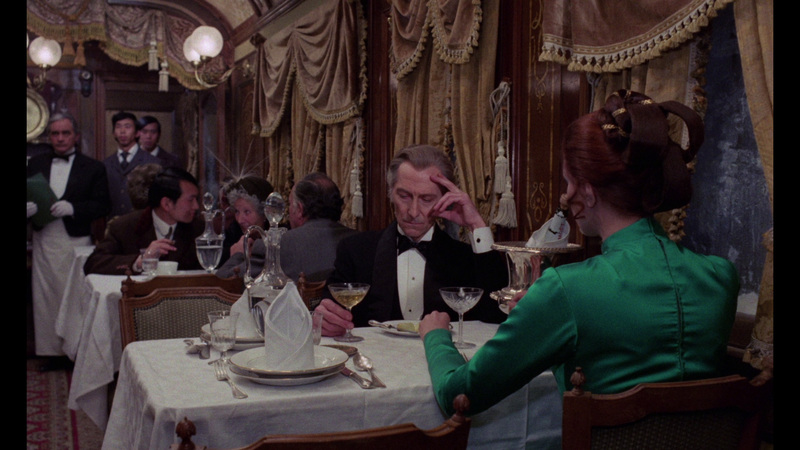 The train is quite cramped, however, and it isn’t long before he runs into Dr. Wells (Peter Cushing), a competitive researcher of sorts who takes quite a liking to one of the female passengers (Helga Line) onboard who needs somewhere to sleep during the long ride. Wells seems pretty jovial on the surface but his true colors show when he pays off one of the baggage men (Victor Israel) to open that mysterious crate Saxton has brought on board. When that baggage man disappears, people start to wonder what’s become of him. 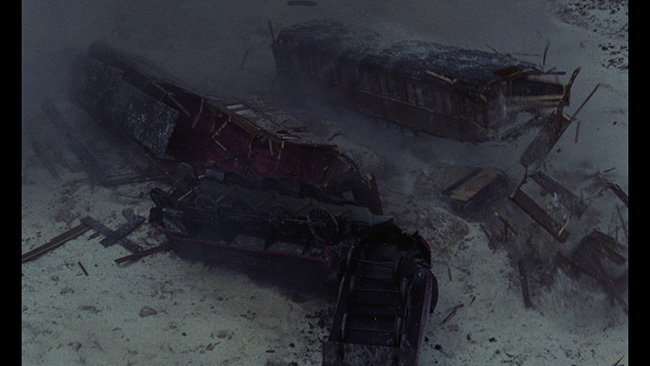 Eventually he’s found inside the crate, his eyes white and bleeding and it becomes obvious when more passengers show up in a similar state that whatever it is that Saxton discovered is running loose on the train and killing randomly. 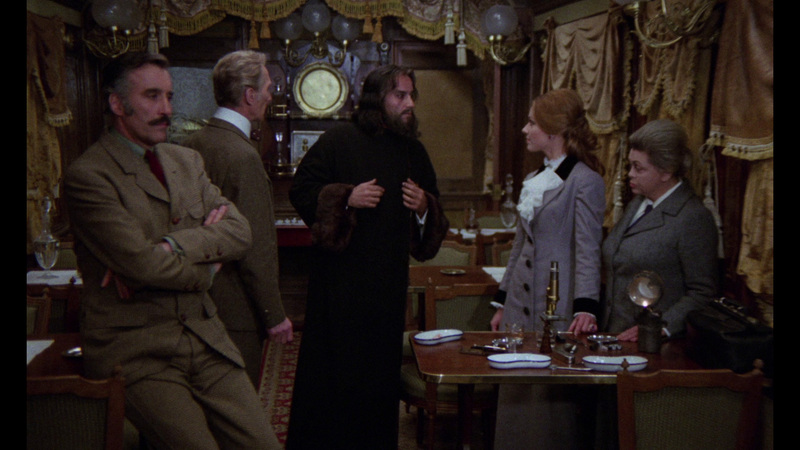 Complicating matters further is the presence of a Countess (Silvia Tortosa) and her keeper, a rather insane monk (Alberto de Mendoza) with a giant Rasputin beard – and then the train gets boarded by Cossacks (lead by Telly Savalas!). Wells, always the man of science, does some investigating of his own – namely examining the brains of the victims - and soon learns the truth about what this creature is up to. A staple of crap quality public domain releases over the years, it was nice to see Severin and now Arrow take this title on, spruce it up as best they can and go all out with the extras. Why? Because the movie is a blast. Not only do you get Lee and Cushing doing some of their finest work together here (it’s been infamously noted that Cushing didn’t want to do the movie as it was too soon after his wife’s passing and that Lee talked him out of bailing, so they were probably bonding a bit during this shoot) but we get Savalas, completely miscast as a Cossack and given far too little screen time, and Eurohotties Helga Line and Silvia Tortosa thrown into the mix for good measure. With this rock solid cast, director Martin manages to overcome the low budget (yeah, those are obviously toy trains being used in a lot of the outdoor scenes but who cares) and deliver an entertaining monster movie with some great cinematography and cool effects. Those effects work really well here, actually. 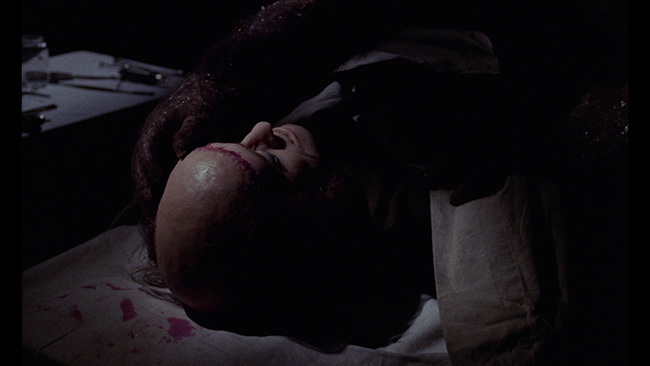 It’s fair to say that the guy in the monster suit is obviously phony but the whole ‘white, bleeding eyes’ thing is still creepy no matter how many times you sit through this one and we even get some impromptu brain surgery here too, just to up the ick factor a bit. John Cacavas contributes an excellent score that sounds like it was lifted from a spaghetti western and which helps propel the film to an unexpected but completely awesome conclusion which we shall not spoil in this review. In short, you don’t have to be a Hammer fanatic or Eurocult superfan to appreciate this one, as it’s really got something for everyone. Pretty ladies, great leading men, a giant killer monkey man, cool trains, some good gore, a crazy monk and a killer score – what’s not to love? Arrow brings Horror Express to Blu-ray on a 50GB disc featuring a ‘brand new 2K restoration from original film elements’ framed at 1.66.1 widescreen and in AVC encoded 1080p high definition. The previous Blu-ray from Severin Films suffered from some compression issues, the Arrow fares better in this department. It’s also a bit darker than that disc, but not in a bad way as by compression it looks like the contrast on the Severin disc might be a bit hot. Detail is quite strong here and colors look really good. There’s solid depth and texture can be impressive at times. The film’s natural grain structure has been left alone, thankfully, and there’s no evidence of noise reduction or edge enhancement problems. A few minor specks pop up here and there but otherwise the transfer is clean and clear and generally quite solid. Arrow offers up an English language mono in LPCM format with optional English SDH subtitles. 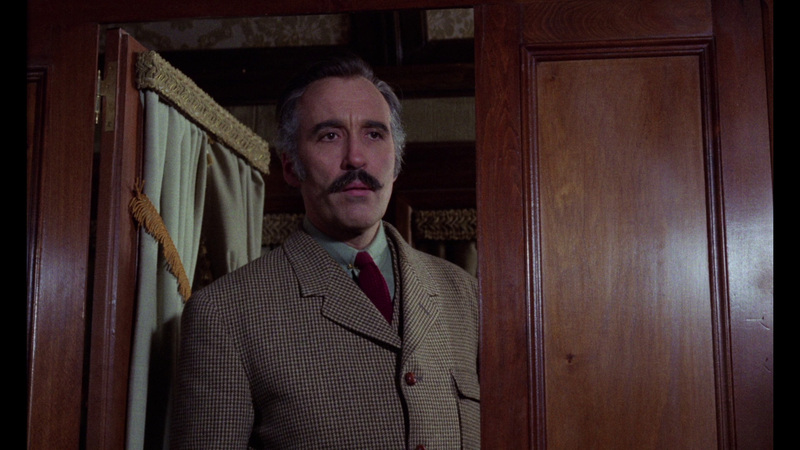 The Spanish language track from the Severin disc has not been included here. Quality of the English track is fine. Dialogue is always easy to understand and perfectly audible. The track is clean and nicely balanced, no problems here. New to this release is an audio commentary with Stephen Jones and Kim Newman who, if you’ve heard any of their prior tracks together, always do a great job dissecting the films they comment on. Newman is a whirling dervish of enthusiasm here, he’s really, really into it and Jones is right behind him – these guys clearly get a real kick out of the picture. 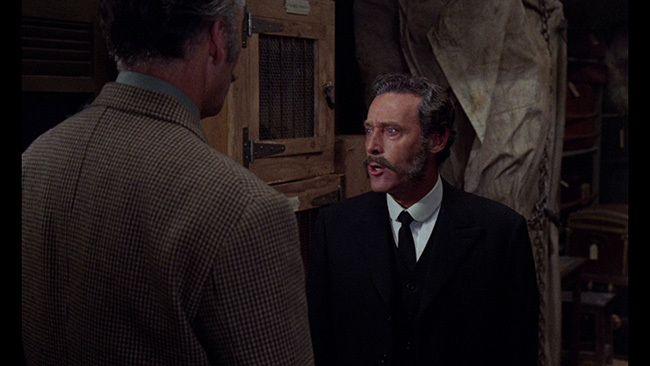 As the film plays out they talk about the picture’s release and distribution history, what separates this from so many of Lee and Cushing’s other collaborative vehicles and how this one really plays to their strengths, and how in a lot of ways the two stars parody their own images. 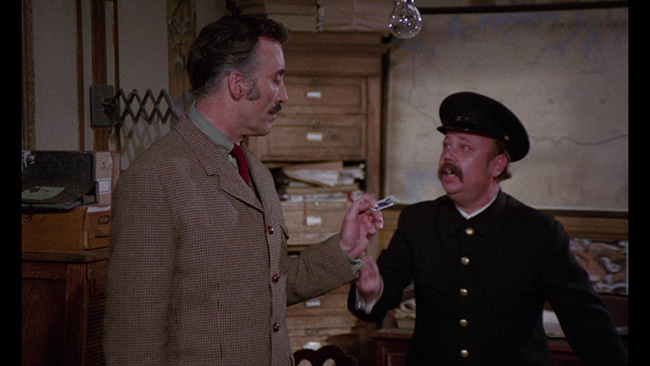 Newman notes some of the film’s Spanish traits, comparisons between this film and other ‘train movies’ like Murder On The Orient Express, the use of the monster in the film, the effects work, the score, the cinematography and lots more. Great stuff. Also new to this disc is Ticket To Die, a nine-minute piece where Steve Haberman talks about the political shifts that were occurring around the time that this film was made and how that may have played a part in setting this film apart the from Hammer and AIP films made before. 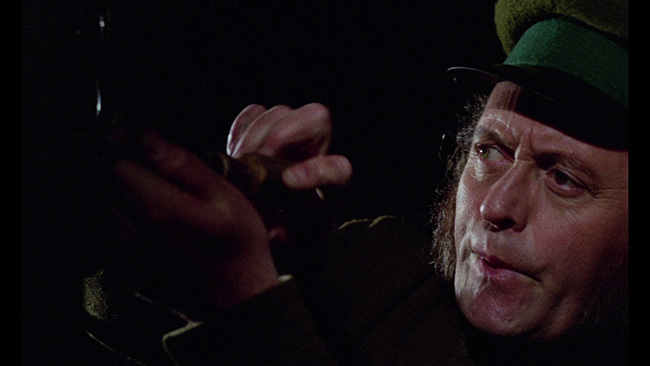 He then goes on to offer an appreciation of the film, noting the quality of Martin’s direction, the editing and of course, the quality of the cast in the film. 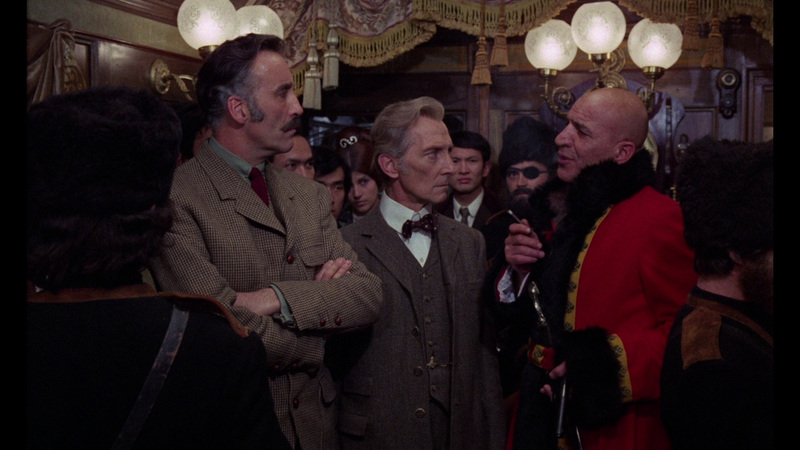 He also notes that it’s interesting to see Lee and Cushing play friends in the film, rather than rivals, and how a ‘warmth’ comes through here that we don’t necessarily get in some of the other projects they made together. Night Train To Nowhere is another exclusive that features Ted Newsom talking about his friendship with the film’s producer, Bernard Gordon. Here in this fifteen-minute piece we learn Newsom’s thoughts on the picture, what makes it fun, how it blends genres and influences very effectively, before he then goes on to detail Gordon’s career, how he got his start at Universal, his appearance in front of the House Un-American Activities Committee, some of the pictures he worked on without credit (including the script for Day Of The Triffids), how he came to produce Horror Express and bring Lee and Cushing on board, details of the production, and quite a bit more. Newsom is always a good interviewee and storyteller, and he’s got a lot to say here that should be of interest to fans of the film. 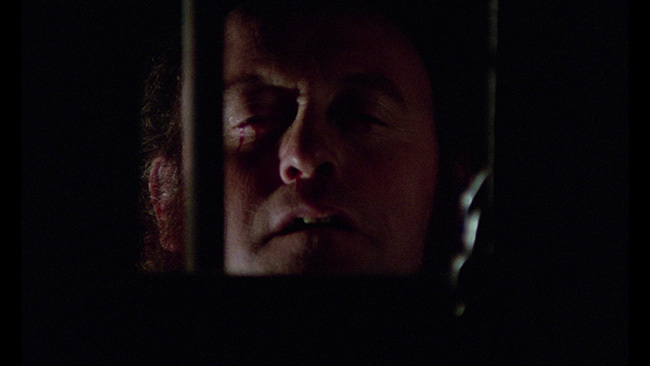 Carried over from the Severin Blu-ray release is a seven-minute introduction from former Fangoria editor Chris Alexander in which he talks about discovering this film in a discount bin at K-Mart (this writer also discovered the film for the first time on VHS at a discount bin at a local drug store!) and how as he’s learned more about horror movies, this one in particular over the years, he’s grown to appreciate despite being instantly drawn in by it on that first viewing years ago. It’s a nice retrospective look at the piece, but not quite as interesting as the fourteen-minute interview with director Eugenio Martin, also from the Severin disc, who talks about the state of Cushing’s personal life around the time this film was made, how the project came to be, what it was like working with Cushing and Lee and how he did the best he could with the budget he had. Martin is pretty open about his experiences here and the interview is a nice addition to the set. 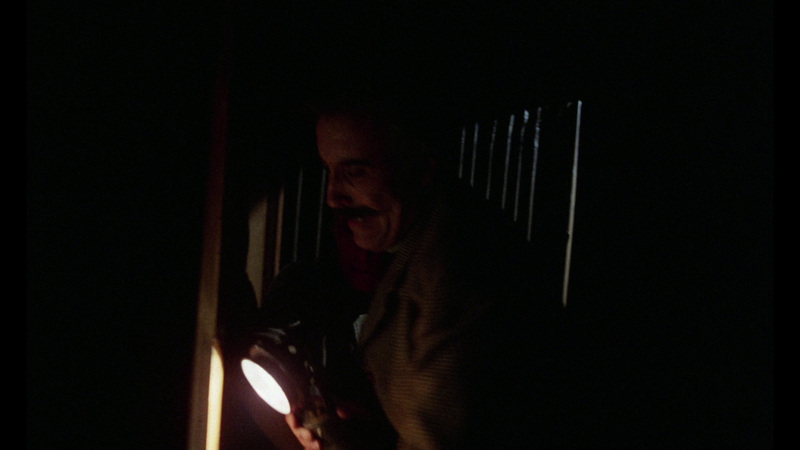 The late Bernard Gordon, who produced the movie, also pops up here and talks on camera for half an hour about his problems in the 1950s with McCarthy era blacklisting, the writing of a few other films he was involved with, and of course, his work on Horror Express. 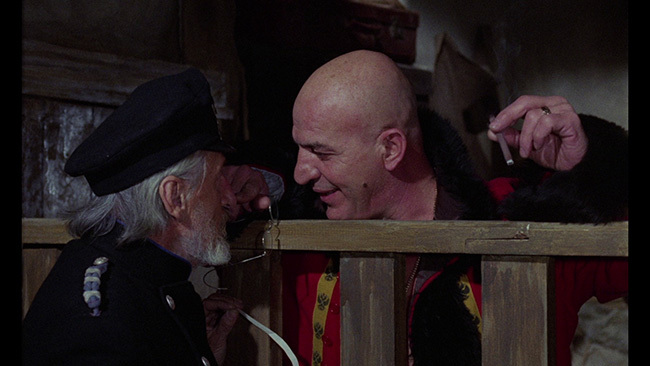 Composer John Cacavas talks for eight minutes about his relationship with Telly Savalas – he not only scored this movie in which Telly appears but produced two of Telly’s albums and handled most of the musical duties on Kojak. It’s a fun look back at the time they shared together and Cacavas has got some interesting stories to tell about the late actor. 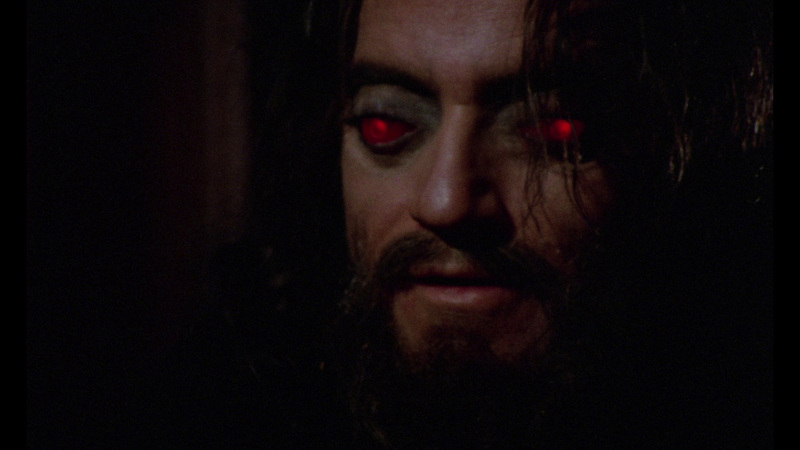 These are also carried over from the Severin disc. 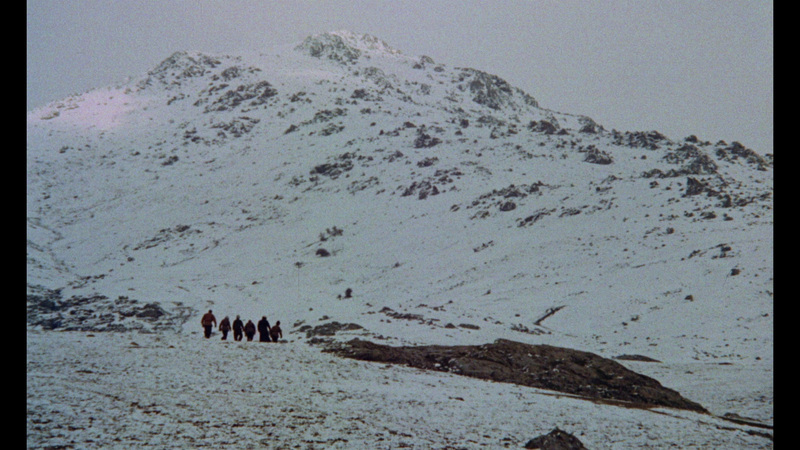 Rounding out the extras is the film’s original theatrical trailer, menus and chapter selection. Finished product is said to come with neat cover and a booklet, but those weren’t provided for review so use your imagination there. 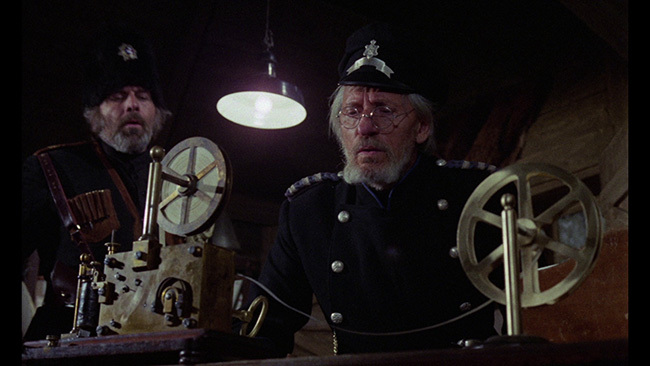 Missing from this release and included on the Severin is the extensive audio interview with Peter Cushing, which is kind of a bit omission and a good reason to hold onto that older disc if you’re a completist or a Cushing fanatic. 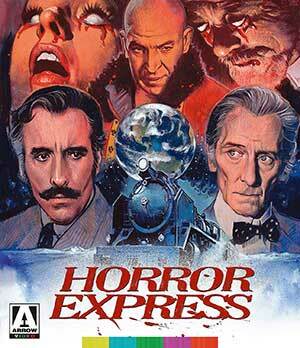 Horror Express remains a lot of fun, a film that features some great performances and loads of atmosphere. Arrow’s reissue offers a very nice transfer, fine audio and a nice selection of extras old and new. 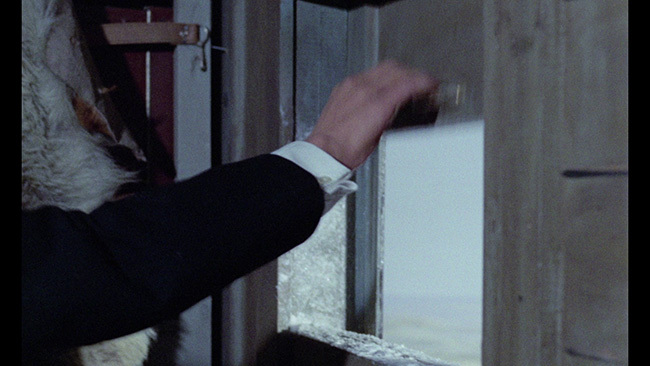 Recommended – just hold onto that older disc for the Cushing interview. 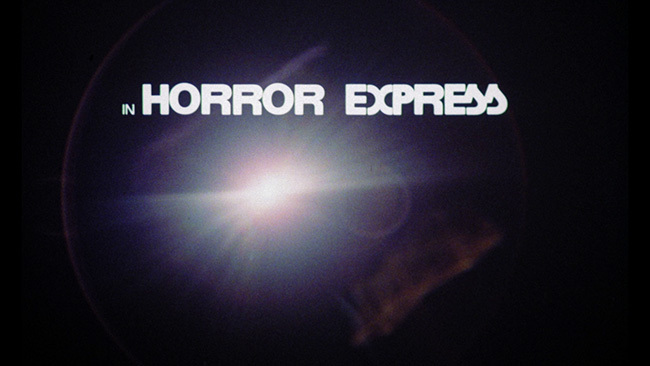 Click on the images below for full sized Horror Express Blu-ray screen caps! I have great memories of this movie. It scared the living hell out of me when I was a young lad. Excellent genre film. Uh oh... 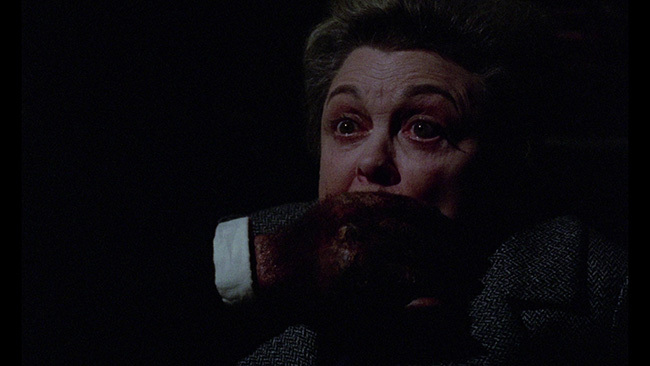 Some folks on the Classic Horror Film Board are reporting audio sync issues. Good to hear... I haven't had a chance to play the disc yet myself.